Back in the 1980s when the world was young, Tracy and Laura Hickman were broke. A business deal had gone south and taken $30,000 of their savings with it, so when TSR approached them with a job offer, so long as they moved to Wisconsin, they were eager and willing. Despite dire warnings from their parents the Hickmans took the plunge, and thank God they did, else Count Strahd von Zarovitch and the whole Ravenloft experience might have remained just another Halloween adventure prototype. The 1983 Dungeons and Dragons Intermediate scenario Ravenloft is the ur-text for the setting, which the Hickmans had been working on for years before their trip to Wisconsin. 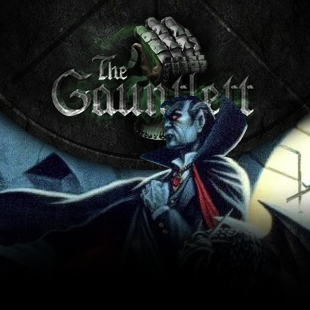 In it, four to six adventurers who've grown tired of life invade the forbidding Hammer Horror castle of Count Strahd, explore it from deepest oubliette to tallest spire, and hopefully put an end to the vampire's reign of terror. It's not as lethal as that old favorite, Tomb of Horrors, but it does have a well-earned reputation as a mincing machine, capable of devouring entire parties in a single encounter. Gamers loved it. Sure, it was huge and full of action, action, action, but it also featured one of the most interesting villains in tabletop roleplay. Count Strahd and his obsession with a long-lost love dominates not just the scenario that introduced him to the world, but the entire Ravenloft gothic horror aesthetic. Horror in Ravenloft the setting isn't about jump scares and oceans of gore, or even about monsters; it's the terror that comes with tragedy, the nightmare created by obsession and dark desires. In the Ravenloft core setting, first published in 1990 by TSR and later reworked in the early 2000s through White Wolf's Sword & Sorcery imprint, you play as a hero in a gothic landscape. The setting is divided up into a number of different Realms, each with their own flavor. A Realm might be the size of a kingdom, or it might be as small as an island or village, but each is divided from the other by the Mist that encircles each one. This Mist serves a twofold purpose: it enforces the mystery behind the workings of the world by preventing easy navigation between Realms, and it allows the Dungeon Master to create entirely new Realms of their own devising, letting these Realms emerge from the Mist. Each Realm is dominated by one Darklord - Strahd in Barovia, undead wizard-king Azalin in Darkon, and so on - whose personalities and desires create and fundamentally shape, or change, the Realm they inhabit. So, where Strahd is obsessed with his beloved, Azalin mourns his dead son, and is driven by a desire to change things, or at least become a better parent. His experiments with cloning, and a strange invention, end up killing every living creature in Darkon's capital city, and turn his only useful clone-son into Death incarnate. Thus the cycle continues, with each attempt to somehow 'fix' things creating new horrors, which the characters then have to deal with. The 1990s TSR supplements have a lot to recommend them, but when Wizards of the Coasts bought out TSR, Wizards felt it had little use for ghosties, ghoulies, and things that go bump in the night. It was happy to let White Wolf, already well known for its horror titles, go to town with its gothic IP. The Sword & Sorcery Ravenloft series for 3.5 Edition D&D is a whole lot of horrific fun, and are the books you're most likely to find if you go searching through second-hand shops or a convention's merch hall. Speaking personally, I swear by them, and I'm about as far from a fantasy RPG guy as you can possibly imagine.